Timika, One of the national programs is the improvement of health for the people of Indonesia. 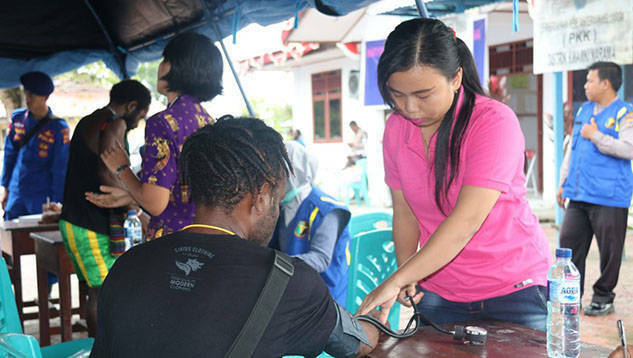 Therefore, in the framework of HKGB's 66th anniversary, Polairud Papua Police in cooperation with Doctor Share held a health service by providing free service to the community in Kwamki Narama Mimika district. Director of Water Police of Papua Police Commissioner Yulius Bambang, on the sidelines of the activity said that in this medical service activities is a very important activity. "Our goal is to enforce this activity. We only want to help the community of the villagers, especially the people of Papua who really need medical assistance. We are working with this activity, hopefully the community here can move and be healthy again," said Kombes Pol Yulius Bambang. Meanwhile, the leadership of Doctor Share, DR. Lie A. Dharmawan said that Doctor Share from the beginning has positioned itself as a partner of the government to assist the government and build the nation and state of Indonesia in the field of health. "We are moving especially in the medical field, providing assistance to those in need especially in remote areas.We do services from Sabang to Merauke, and our hope for the future in order to continue to collaborate with all parties to provide assistance to reach those in the area remote, to provide assistance so that they also enjoy the services enjoyed by our sodara sodara especially in the western part of Papua, Timika, "said Lie doctor with enthusiasm. Meanwhile, Mimika Kapolres AKBP Agung Marlianto SH. MH., Thank to the Director of Water Pol who has worked with Doctor Share to implement social or health service by serving free medical treatment in Kampung Kwamki Narama. "As we know with the Kwamki Narama region this is a fairly advanced area compared to other districts, but because of the long conflict gradually lagged behind, the conflict is very disturbing economic progress of the community," said Police Chief Mimika. Furthermore, he said, with the arrival of Water Pol and doctor share bring brightness to the community in Kwamki Narama especially people who have never touched health services. "With the help of this health surely greatly ease the burden of our sodara sodara disturbed health.I hope in the future hopefully from this activity so that people can be healthy and activity like biasany," said Police Chief Mimika AKBP great marlianto SH., MH.